TRON: Legacy has probably received the heaviest marketing campaign of any film this year. Obviously, Disney is hoping to make a new franchise with a combination of fans of the original and a whole new audience to the world of TRON. But can a 28 year break, impressive visuals, and an onslaught of commercials and footage bring in the money to warrant another sequel? Disney can do all it wants, but if the movie isn’t good people won’t see it. Word of mouth spreads fast in this country. I am here to tell you that this film isn’t bad, but I don’t think it’s good enough to continue a franchise. Sam Flynn, a rebellious 27-year-old, is haunted by the mysterious disappearance of his father Kevin Flynn, a man once known as the world’s leading video-game developer. When Sam investigates a strange signal sent from the old Flynn’s Arcade — a signal that could only come from his father — he finds himself pulled into a digital world where Kevin has been trapped for 20 years. With the help of the fearless warrior Quorra, father and son embark on a life-and-death journey across a visually-stunning cyber universe — a universe created by Kevin himself that has become far more advanced with never-before-imagined vehicles, weapons, landscapes and a ruthless villain who will stop at nothing to prevent their escape. I really have mixed feelings on this film. I think the first thing to discuss is the 3-D since this will attract some people to see it. The film is very visually impressive, but this is not due to the 3-D. I have yet to see a film that truly astounds me with the 3-D like Avatar did. As I said before though, the visuals are terrific. The world that is created is engaging, and you can’t keep your eyes in just one spot on the screen. There is always something new to look at. I also love the most of the acting in this film. While no one will be winning an Oscar, Jeff Bridges, Olivia Wilde, and Michael Sheen all turn in great work. I was not completely on board with Garrett Hedlund. Some times he was good and other times his acting was just not there. My biggest complaint on the film is the story, but let’s be honest, no one is seeing this film for the story. I was expecting more of a Gladiator type story where Sam would be thrown into the world and have to battle through many games to escape. There were only two games played towards the beginning of the film. I appreciate that they wanted to develop character and focus a little on the story, but I started to get bored. As I said, this film is all about the visuals, and I wanted more games. I also hated CLU. I know they wanted to make Jeff Bridges younger, and it would have been great to see the CGI used maybe two or three times. The character looked just like any character in A Christmas Carol, Beowulf, or The Polar Express. This was definitely a case of less is more. I found it distracting more than anything else. TRON: Legacy is not a bad film. It is just something that should be seen in the summer. The visuals are great. I loved the music by Daft Punk. And most of the film is fun to watch. But the story didn’t engage me like I wanted it to. I am okay with not visiting the world of TRON for another 28 years. 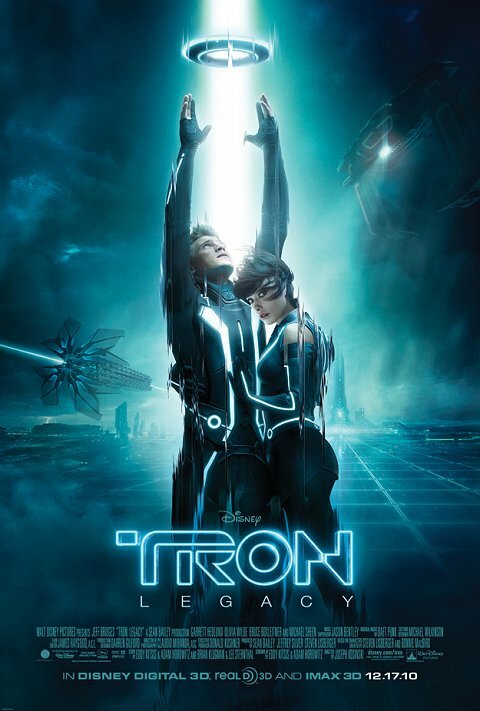 I give TRON: Legacy a C+.